Mur Lafferty, The Shambling Guide to New York City. Orbit, New York, 2013. Review copy courtesy of the lovely people at Orbit. For everything there is a time, and for all things a season under heaven. It’s as true for books as it is for anything else, but I’m not sure that there will ever be a season where I am able to read and enjoy The Shambling Guide to New York City. The large amounts of praise and enthusiasm it has received since its initial publication overrode my initial instinct that this wasn’t a book for me: but in this case, the initial instinct is right. I have read only the first two chapters and some bits from the middle. And between me and this book there is a vast cultural divide. The main character, Zoe, is pushy and professionally business-aggressive in the way that is stereotypically USian – stereotypically New Yorker – and does not do well at accepting hints or taking no for an answer. The first chapter had me cringing in situational embarrassment while Zoe breezed insistently along, and sections from the middle chapters make me think this is a book about the culture clash of Young Urban Professional meeting the Professional Urban Monster Underworld. And I’m not – I don’t quite know how to put this. There is something fundamentally alien about the supposedly normal human protagonist of The Shambling Guide to New York City, something foreign to me, that makes it really difficult for me to understand, or relate to her. In the same way I find myself bemused at middlebrow popular American so-called “women’s fiction,” I don’t get this book. Its sense of humour is so utterly aslant to mine, I don’t even see how it is funny. Which is very frustrating. But at the same time, since I’m not being paid specifically to finish it, and since I prefer to use my Tor.com column to talk about things I actively enjoyed, I’m going to shelve it and hope I like it better – or at least enough to finish – in a couple of years. 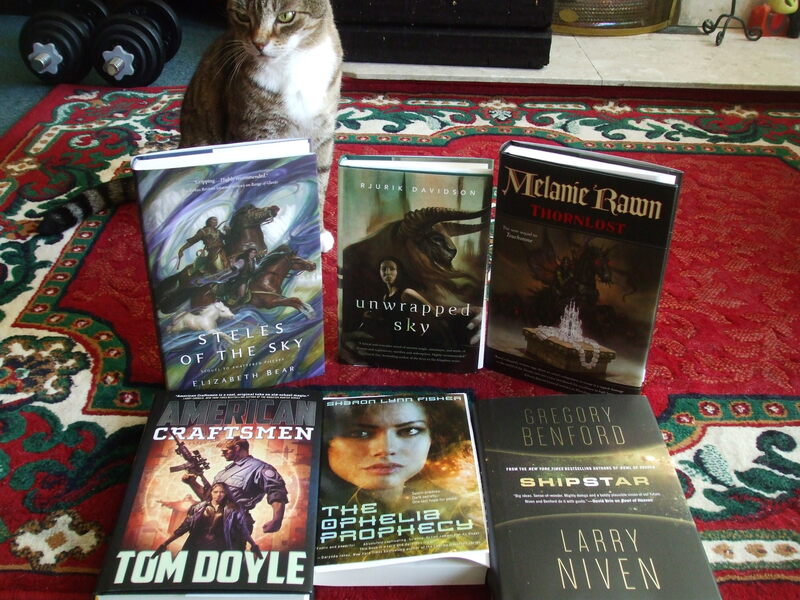 So that’s Elizabeth Bear’s excellent STELES OF THE SKY; Rjurik Davidson’s certainly-not-to-my-taste UNWRAPPED SKY; Melanie Rawn’s THORNLOST, third book in a series; Tom Doyle’s military fantasy AMERICAN CRAFTSMEN; Sharon Lynn Fisher’s science fiction romance THE OPHELIA PROPHECY; and Benford and Niven’s SHIPSTAR. Elizabeth Moon, Crown of Renewal. Orbit, 2014. Review copy courtesy of Orbit UK. Concluding volume to Moon’s “Paladin’s Legacy” series. Read for inclusion in the column. Ends more with a whimper than a grand boom. Gaie Sebold, Shanghai Sparrow. Solaris, 2014. Entertaining steampunk/magic adventure that mixes caper and school stories in the seamy underbelly of the late 19th century Great Game and has some pretty dark points. Recommended. Faith Hunter, Black Arts. Roc, 2014. Latest installment in Hunter’s “Jane Yellowrock” urban fantasy series. Fun, diverting, not too serious. Timothy Zahn, Cobra, Cobra Strike, Cobra Bargain, Cobra Alliance, Cobra War, Cobra Guardian, and Cobra Slave. Baen, various dates. The first Cobra trilogy was originally published between 1985 and 1987, and it’s a little elderly now. But Zahn can always be relied on for an entertaining story, and I inhaled the trilogy omnibus and its sequels over the course of two days. Good fun, those books, if a little odd. Mike Moscoe (aka Mike Shepherd), The First Casualty, The Price of Peace, and They Also Serve. Ace, 1999-2001. Entertaining military science fiction novels, albeit annoyingly “USA-in-space” in their assumptions and set-up. Mike Shepherd, Kris Longknife: Undaunted, Kris Longknife: Redoubtable, Kris Longknife: Daring and Kris Longknife: Furious. Ace, 2009-2012. See above, except with more descriptions of breasts. Justine Larbalestier, The Battle of the Sexes in Science Fiction. Wesleyan University Press, 2002. Larbalestier has gone on to be better known as a novelist than an academic, but this book, based on her doctoral thesis at the University of Sydney, is an extremely interesting survey and analysis of the presence and representation of women in science fiction between the late 1920s and the 1970s, with a further discussion of James Tiptree Jr., Tiptree/Sheldon’s influence, and the role of the Tiptree Award from its creation in the early 1990s. It’s a really enjoyable piece of academic writing, and one I’m glad to have read. Zoë Ferraris, Night of the Mi’raj, City of Veils, and Kingdom of Strangers. Little, Brown & Co. 2008, 2010, 2012. Library books. A series of mysteries set in Saudi Arabia. The protagonist of the first novel is a young devout Palestinian called Nayir; in the following two, more of the protagonist duties are taken over by Katya Hijazi, one of the few female lab technicians with the Saudi police. I heard of these via first Marissa Lingen and then Marie Brennan. They’re really enjoyable books, although the mystery element is not always entirely well developed: the interest and the tension is in how the cultural norms and laws of the kingdom constrain the characters’ behaviour. It is rather difficult to investigate a crime when women and men are not supposed to speak to each other unless they’re related, and Katya could lose her job at any time for any perceived violations of the virtue policy of her employers. But the characterisation is excellent, and both Saudi Arabia and Islam are treated with a depth and a respect I haven’t often seen in fiction. Stephanie Saulter, Binary. JFB, 2014. Review copy. Read for review for Strange Horizons. Interesting sequel. Recommended. Sun-Tzu, The Art of War (with a selection from the Chinese commentaries). Penguin, 2009 (2002). Edited and translated by John Minford. An interesting and very readable translation. Minford has chosen to use short lines and line breaks after phrases, giving a feeling of aphoristic poetry to Master Sun’s work. I enjoyed reading it. John H. Langbein, Torture and the Law of Proof: Europe and England in the Ancien Régime. University of Chicago Press, 2006 (1976). A brief history of torture as a legal instrument in Europe prior to the 19th century. It could have done with a little more explanation of the difference between the Roman law systems of Europe and the law system of England, but it explains very well why those two systems had different approaches to torture as a legal instrument, and how changes in the standard of proof required for punishment led to a reduction in the use of torture to coerce confessions. 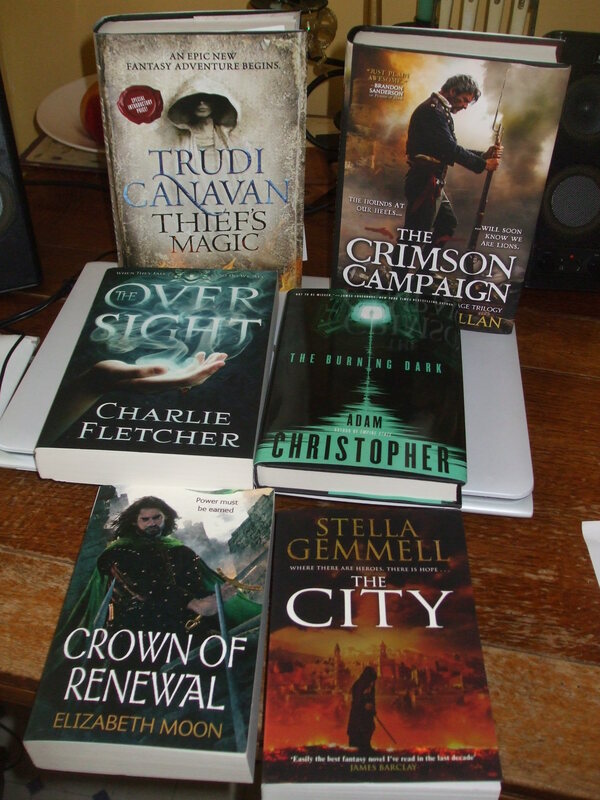 That’s Brian McClellan’s THE CRIMSON CAMPAIGN, Trudi Canavan’s THIEF’S MAGIC, Charlie Fletcher’s OVERSIGHT, Adam Christopher’s THE BURNING DARK, Stella Gemmell’s THE CITY, and Elizabeth Moon’s CROWN OF RENEWAL. Followed by Kristen Britain’s MIRROR SIGHT, Ursula K. LeGuin’s THE UNREAL AND THE REAL VOLUME ONE, S.M. 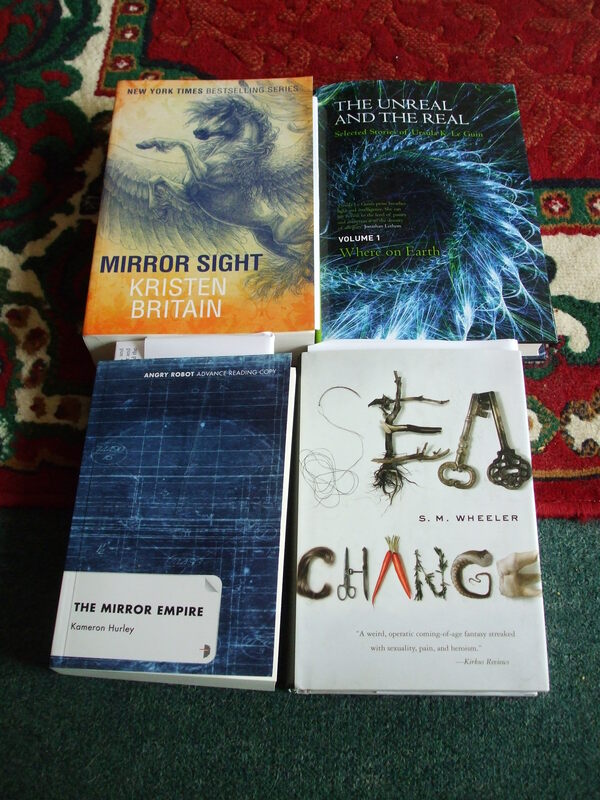 Wheeler’s SEA CHANGE, and Kameron Hurley’s THE MIRROR EMPIRE. I always feel guilty about not finishing a book, unless it is a library book. I confess with Irene Radford’s The Silent Dragon I barely gave it time to get started: with a prologue from the point of view of a dragon talking about a plague and a first chapter concerning two young boys – princes, with magic – it struck me as very much in the traditional mould. As I’m not familiar with Radford’s work, and I have a great deal else on my shelf, I decided to go with my first instinct and move on. Radford has written any number of books, and if eighties-style fantasy with dragons is your cup of tea, this might be one for you. I didn’t give E.C. Tobler’s Gold and Glass very much longer than The Silent Dragon. It opens promisingly, in an alternate 19th-century Paris, and involves airships and archaeology. The narrative voice is brisk and interesting; but shortly it takes a turn into flashbacks that manages not to maintain my distractible attention. It is not in the novel’s favour with me that its protagonist (or her father) is supposed to be from Dublin: I have made it a habit to avoid portrayals of Irish people in fantasy unless they are from Irish authors or a handful of other authors I have seen do things right before. Perhaps I would’ve read on, otherwise: I may yet one day try it again and see if it holds my attention better then. Julie Czerneda’s A Turn of Light is another book I intend to try again one day, out of grim determination if nothing else. Over 800 pages long in paperback, it is a very rural, closely local fantasy – it reminds me of Patricia Briggs’ The Hob’s Bargain, but where Briggs’ short book gets its feet under it rapidly and moves to drive its plot towards climax and conclusion, Czerneda’s slow burn is a bit of a slog. I stalled out on page 307, because it seems there was going to keep being a lot of running-around-and-going-nowhere, and people keeping secrets from each other for no good reason. I grow older and crankier and harder to satisfy.